Materials are definitions of how a surface should be rendered, including references to textures used, tiling information, colour tints and more. The available options for a material depend on which shader the material is using. Shaders are small scripts that contain the mathematical calculations and algorithms for calculating the colour of each pixel rendered, based on the lighting input and the Material configuration. Textures are bitmap images. 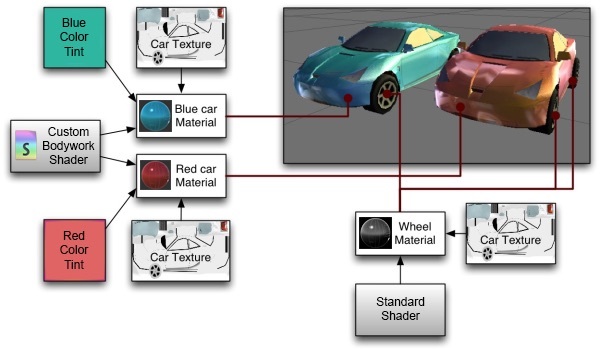 A Material may contain references to textures, so that the Material’s shader can use the textures while calculating the surface colour of an object. In addition to basic colour (albedo) of an obejct’s surface, textures can represent many other aspects of a material’s surface such as its reflectivity or roughness. A material specifies one specific shader to use, and the shader used determines which options are available in the material. A shader specifies one or more textures variables that it expects to use, and the Material Inspector in Unity allows you to assign your own texture assets to these these texture variables. For most normal rendering - by which we mean characters, scenery, environments, solid and transparent objects, hard and soft surfaces etc., the Standard Shader is usually the best choice. This is a highly customisable shader which is capable of rendering many types of surface in a highly realistic way. You may choose the Babylon Standard Material shader for a legacy diffuse workflow. Please refer to the Unity Material documentation for details. To create a new Material, use Assets > Create > Material from the main menu or the Project View context menu. Which shader to use for rendering this material. The specific values for the shader’s parameters - such as which texture maps, the colour and numeric values to use. Custom Shaders are meant to be written by graphics programmers. They are created using the GLSL shader language, which is quite simple. However, getting a shader to work well on a variety graphics cards is an involved job and requires a fairly comprehensive knowledge of how graphics cards work. The BABYLON.PBRMaterial is the default shader material that will be used for all materials using Unity Standard Shader pipeline properties. These include the built-in Standard, Standard Roughness, Standard Specular and any other shader that uses Metallic Type properties (IE: _Metallic). The BABYLON.StandardMaterial is used as the base shader for all non physical babsed rendering shaders. During exportation, the toolkit will scrape all materials looking for standard shader properties like _MainTex and assign them to the standard diffuse shader pipeline. Custom shader materials creates a custom unity shader (.shader) program for use as the design time shader. You can change the content of the unity design time as it is only used for design time WYSIWYG display purposes. 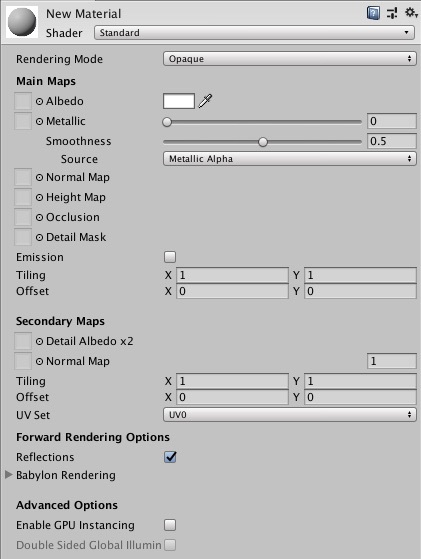 The actual Shader Controller class defines the native babylon shader material class to control the material export. You can create a custom shader material from the Create menu at the top left of the Project panel or by selecting Assets > Create > Babylon > Custom Shader Material from the main menu. The shader controller class is used to interface between the Unity Material inspector properties and the native BABYLON.PushMaterial sub class properties. The controller class uses the shader properties specfied in the custom shader material (.shader) asset. It reads the properties from the material inspector properties and assigns them to the native shader material properties. You can create a custom shader controller script from the Create menu at the top left of the Project panel or by selecting Assets > Create > Babylon > Babylon TypeScript > Shader Controller from the main menu.